Inflammatory bowel diseases (IBD’s), such as ulcerative colitis (UC) and Crohn’s disease (CD), are autoimmune conditions where your immune system attacks your own intestines. It’s thought that there’s no cure for such diseases, so all you can do is try to stay in remission for as long as possible between attacks. 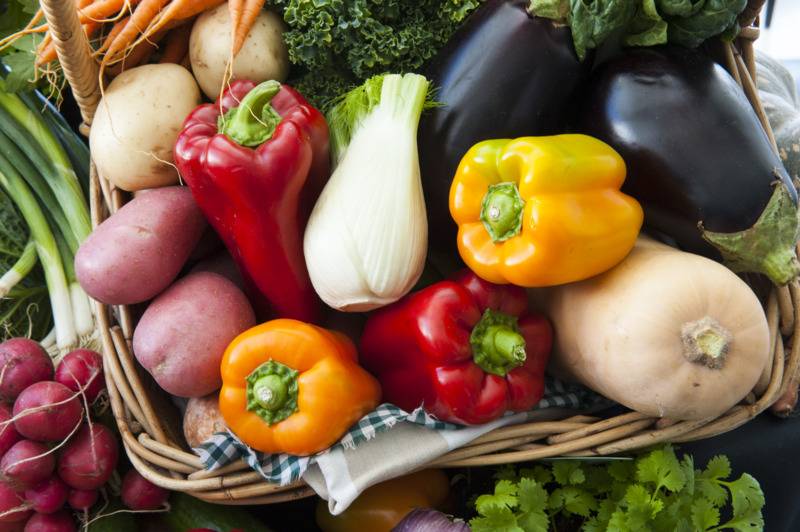 But can a plant-based diet help to both prevent and treat these debilitating conditions? This is a complex topic, so it has been covered in three parts. This is part 5 of 5. Ryan’s complete story 1 is to be found on Dr John McDougall’s website, which is packed with excellent information for anyone wishing to understand more about how to achieve optimal health with a WFPB diet. The following is a summary of his journey. Weightlifter for 15 years, eating as much protein (usually as dairy foods) as he could, as that was what the muscle building magazines and books told him was appropriate. Everything was going great: Completed college, veterinary school, an internship, and four additional years of residency. Married an intelligent and beautiful woman. Worked out with weights four to six times a week, with another two to three workouts a week of cycling, running, hiking, kayaking, skiing or rafting. Out of the blue three years ago he developed CD. At first, he couldn’t eat and was in severe pain. He fell into a dark place. Lost about 15 pounds of muscle, gained fat. Thought he could only eat easily digestible foods, such as simple sugars, due to two large and extensive intestinal strictures caused by the disease. Family problems developed, along with pain, fatigue, lethargy, and depression. All he wanted to do was sleep, relax, or lie on the couch and watch TV. Developed work problems since he had to take many sick days. Eating felt like a chore. Treatments (prednisone, high-end immune-modulating drugs) for his CD my disease didn’t help much. Was being pushed to have surgery to remove several feet of his intestines (including the strictures). Even though none of his medications helped, all five of his board-certified gastroenterologists and two board-certified surgeons strongly advised against stopping them. He was told surgery would help with the strictures, but that different regions of inflammation always recur in CD patients after surgery. He was repeatedly rushed to the hospital for emergency attention. Even though he was told that his intestines were obstructed, he still refused surgery because he knew it was only a temporary fix. Aside from surgery, he was willing to try anything in order to regain his life. He tried different diets and solutions, but none worked. In spite of all his doctors’ recommendations, he stopped all his medications. He felt they had not even listened to his issues or heard him when he told them his medications hadn’t helped at all. He realised that they simply had nothing else to offer him. They didn’t know anything about the disease other than how to diagnose it. Finally, he found Dr. McDougall after a friend gave him a copy of The China Study. Since his condition was so severe, he started with the elimination diet as Dr. McDougall suggested. The first few days he only ate brown rice and canned peaches. 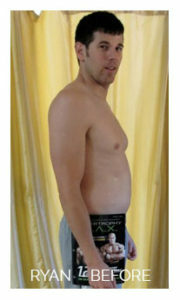 Within a week he started feeling better and was without the daily cramping and stomach pain. He gradually added in different foods each week, and would take a break if he had a reaction to a specific food. The going was slow. One year later, he felt better before his illness showed up. His diet now mostly consisted of white sweet potatoes, brown rice, black beans, spinach, bananas, oranges, tomatoes, broccoli, peanut butter, and a few nuts. He can eat most vegan foods. He found he had trouble with refined sugar, too many refried and garbanzo beans, corn, and several fruits. He now feels like a “normal” person almost all the time. He works out hard, whether it be weightlifting, running, cycling, hiking or anything else outdoors without feeling exhausted. He can handle the stress and long hours of work. At one point, he fell into the trap of thinking he needed to eat a high-protein diet to see success with his weightlifting. After a week of eating chicken, he went through another two weeks of painful torture. He slowly recovered. The experience proved to himself once and for all that it was his diet that most influences his disease. When he returned to his regular gastroenterologist, she thought that the disease just coincidentally went into remission and that it would strike again. Over a period of months, he had his blood work checked three times. The anaemia, elevated white blood cell count, and low blood proteins all normalised. His doctor still insisted on 6-monthly check-ups and blood work because she could not believe that this was anything other than a coincidental (and temporary) remission. Social gatherings where people are eating whatever food they want are still difficult for him, and the cravings for sweets and desserts is still there when he allows himself to get hungry. But he tries to always eat a large meal before going to such events. He wanted to tell fellow-sufferers that medication and surgery are not the only answers since they may not even alleviate the symptoms and would possibly only bring temporary relief in any case. In the above video, Sondra explaining in her own words how she suffered with CD for many decades…but how, after many surgeries, psychoanalysis and drugs, she finally found healing by simply eating the diet human beings are designed to eat. Click here for Kelly’s complete story.2 The following is a summary of her journey. Diagnosed with CD at 12 years of age. She had emergency surgery to repair diseased, perforated intestine and nearly died in the process. Left with scars that “left me looking like Frankenstein“, and then had to have surgery again. Decades of eating a ‘normal’ diet but frantically exercising off all the calories, purging, and taking laxatives (none of which helped her CD). Attempted suicide then decided that if she was going to be stuck in this place, she was at least going to try to live a better life. Symptoms from the multiple issues and illnesses she’d been diagnosed with—arthritis, Hashimoto’s, persistent low-grade anemia, and CD started to disappear. She had more energy. Her mood improved. A year after going vegan, she went to a new doctor for a check-up who, after reviewing her medical history was amazed she was not on any medications. The doctor said she had never met anyone with CD who wasn’t on medications. Then the doctor looked at her blood test results and vital stats and her jaw dropped. “Your blood count’s phenomenal. What’s your secret?” she asked. She felt amazing. For the first time since age 12, her body and her were friends again. She eats as much healthy food as she wants. She now knows that her choices make a difference and that she is not only living a healthy life, but she is also living a compassionate, empowered life. And that congruence between what she believes and the choices she makes has brought a deep healing to her life that she says she never knew so much healing could come from what’s on a plate. 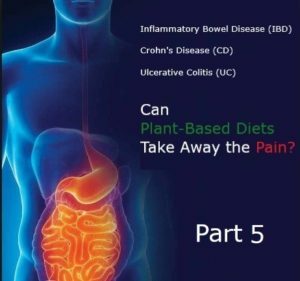 If you have a life-changing story regarding plant-based nutrition and any form of IBD (UC or CD), write to me at joe@wholefoodplantbaseddiet.com and let me share your inspiring story with others. CD is a chronic inflammatory disease of unknown cause, although there are theories: one theory suggests an abnormal immune response to gut bacteria; another suggests processed foods or recently emerged allergens may be responsible; additionally, there appears to be a genetic factor (gene NOD2) running in families.4 Other causal factors may include certain viral or bacterial infections, ethnicity, smoking and even the use of a treatment for acne scars (isotretinoin – although there are strong objections5 to this drug being responsible).